Today marks our third and last day amongst the I-Kiribati of the Phoenix Islands. The morning marked a last and intensive run of shore, snorkeling and science missions upon the island as well as in its beautiful lagoon. After a morning of snorkeling amongst the reef sharks that patrol and police the fish throughout the wreck of the President Taylor steam ship and manta rays that silently guard the lagoon entrance between the dredged channel of Spam Island and quiet remains of a long forgotten hotel on the opposing shore; the crew of the Seamans was given a most fond farewell not likely to be forgotten. An older I-Kiribati man told me of their culture's tale about the young woman who became the first coconut and how whenever someone now drinks from a coconut they are giving her a kiss. around the structure into its roof and wounds, watching over those inside. fraction of what the ship had stocked for the 6 week journey) they would be able to survive at least another year waiting for the arrival of the elusive supply ship. Nonetheless they still went out of their way to slaughter one of their few pigs, and throw us a spectacular feast of fresh lobster, slow roasted pork, fish, clams, rice, and coconut. . . It seems that those in this world with the least are the ones most willing to share of what little they do have. The joining of cultures and peoples from all over of the world in food, dance, and merry-making is a truly beautiful thing. In small ways these peoples resilience comes out: traditional lays strung with VHS tape, a young girl's palm skirt made out of strips of plastic, pieces of rubber and cable striping where seeds once were threaded. . . The legacy of the western world exposed in the rusted abandonment of things left behind. What we would see as junk or trash repurposed and reused into something beautiful. 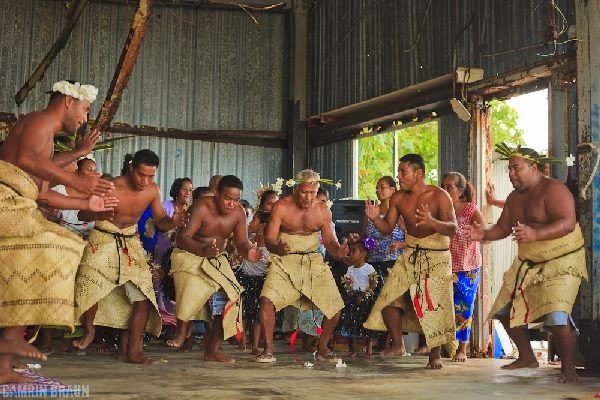 It saddens me that those were the gifts our people left the I-Kiribati in years past, and I hope that in the future, perhaps, something more beautiful can come from those who share these beautiful islands for a time. Upon the morrow we shall sail on, deeper into the heart of the Phoenix Islands, to see and discover what lays over the horizon, our sails full soon again.